The PL3000 Soil Mix system is used on building sites to stabilise and solidify land. It monitors the process of mixing concrete slurry into soil which as well as solidifying the land locks in organic, inorganic and metal contaminates. It consists of a custom touch screen PC computer located in a soil mixing rig running PL3000 Soil Mixing monitoring software. The PL3000 software monitors the process using an array of sensors attached to the rig. 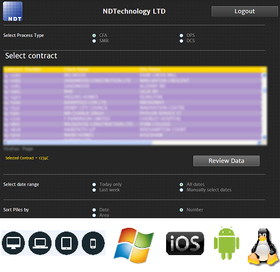 The PL3000 software communicates with a cloud server application, NDTDATACLOUD, via an FTP site using GPRS, allowing the office to access pile profiles and QA information. Complete graphical monitoring package for soil mixing piling rigs. Records the profile for review later.